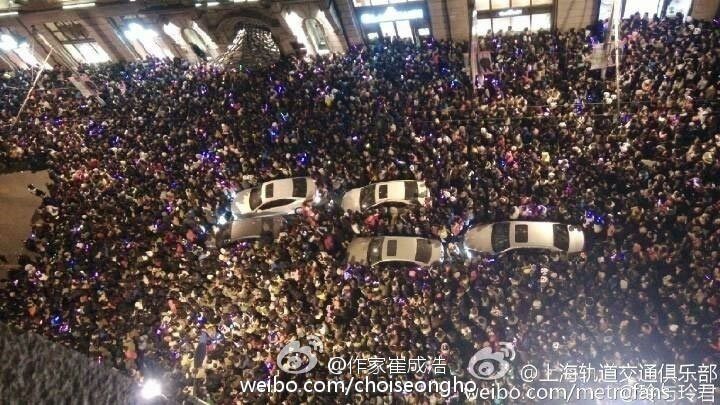 Shanghai New Year’s eve stampede: Images of the ensuing stampede. Images via twitter and instagram. Happy 2015 indeed. 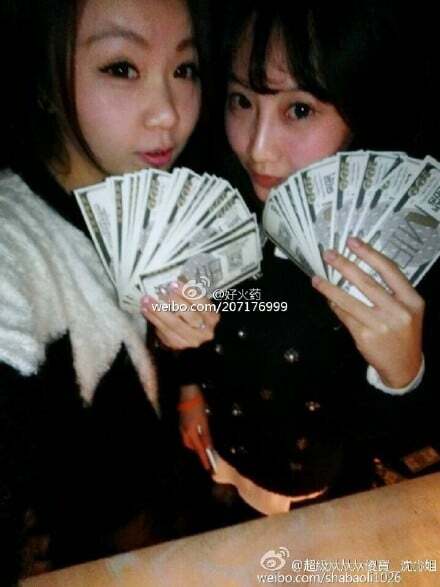 Up to 36 people in Shanghai, China have died along with dozens seriously injured on the first day of the new year after a sudden stampede erupted after festive goers believed (fake money) coupons falling from the top of a building were hundred dollar bills being strewn below. 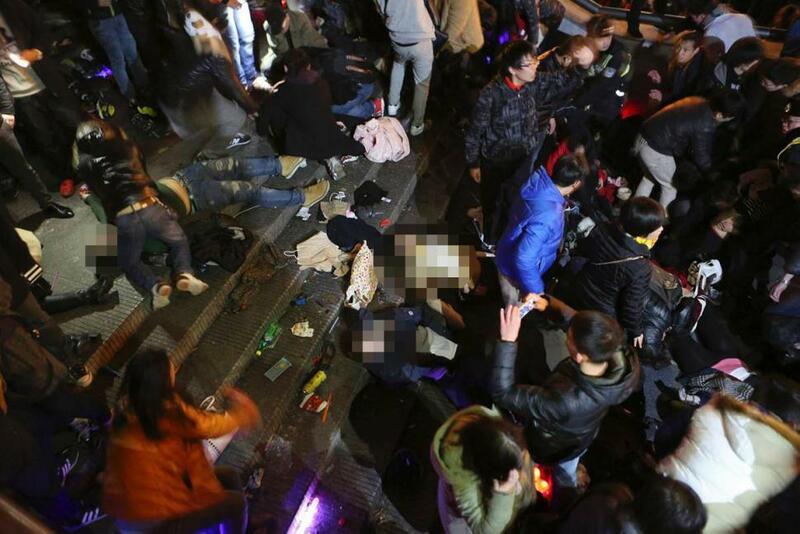 According to state-run Xinhua news agency a sudden stampede broke out circa 11.35pm at Chen Yi Square along a packed street near a river as revelers desperately clambered over the perceived bills. 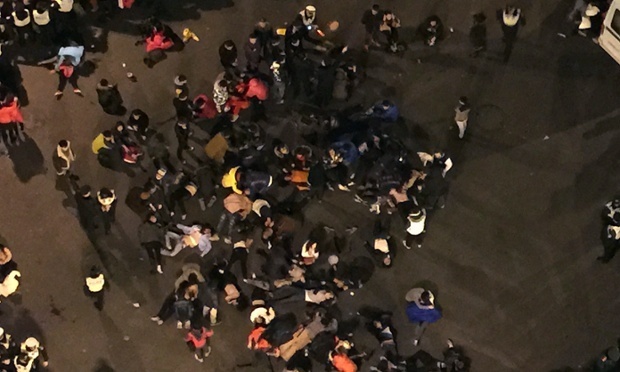 Among the many dead (25 females, 11 males) and 47 injured, 13 seriously were young students, CCTV America reported, citing Shanghai rescue authorities. 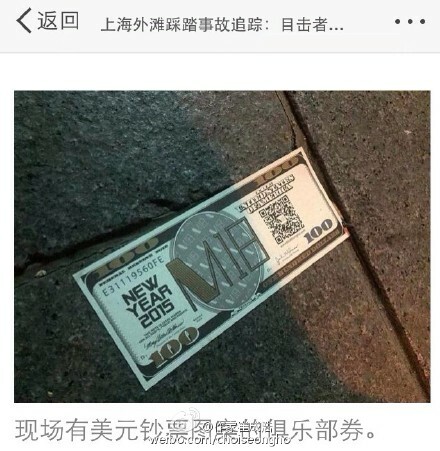 Witnesses would later tell a nightclub, M18 promoting ensuing festivities had taken to disseminating coupons resembling dollar bills with the details of where ongoing festivities into the new year were to take place. Witnesses would reiterate that the ensuing mayhem centered on a stairway leading up to a viewing platform overlooking the river. 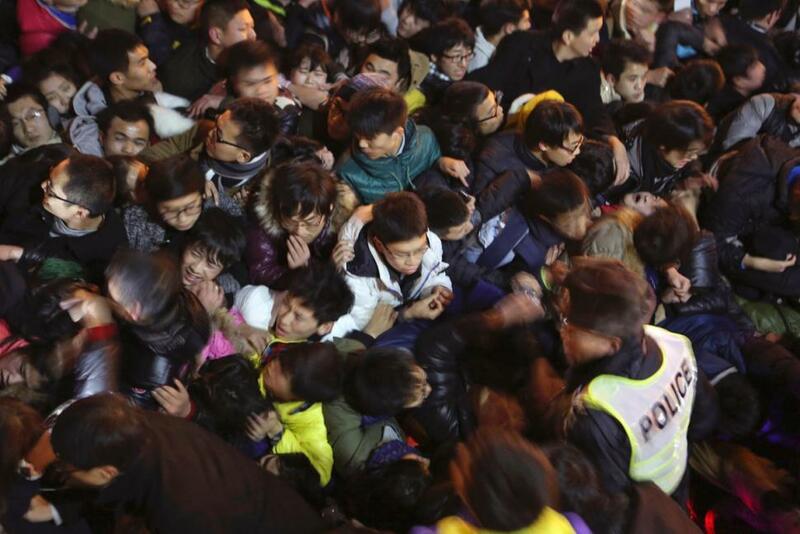 Some people were trying to climb to the platform as others tried to get down, causing panic and mass confusion. 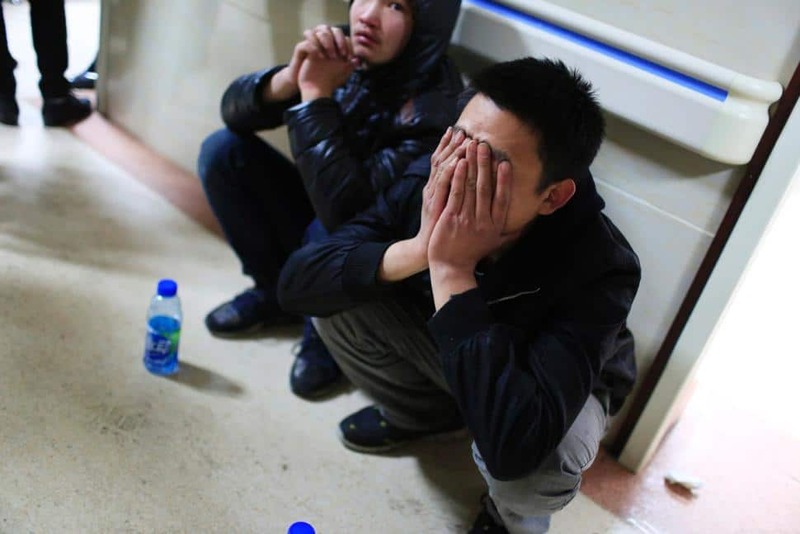 Video from the Reuters news agency showed people sobbing in a hospital waiting room. One woman told CCTV they’d been waiting for hours for information about their loved ones. 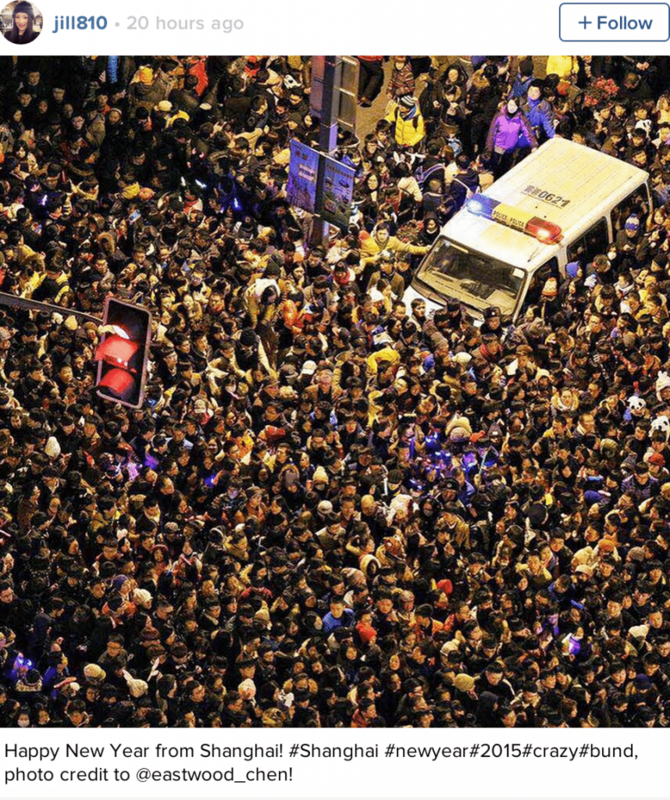 That said Shanghai police insist while the clambering over the faked people may have caused a swelling of party goers, the act itself did not cause the crush. 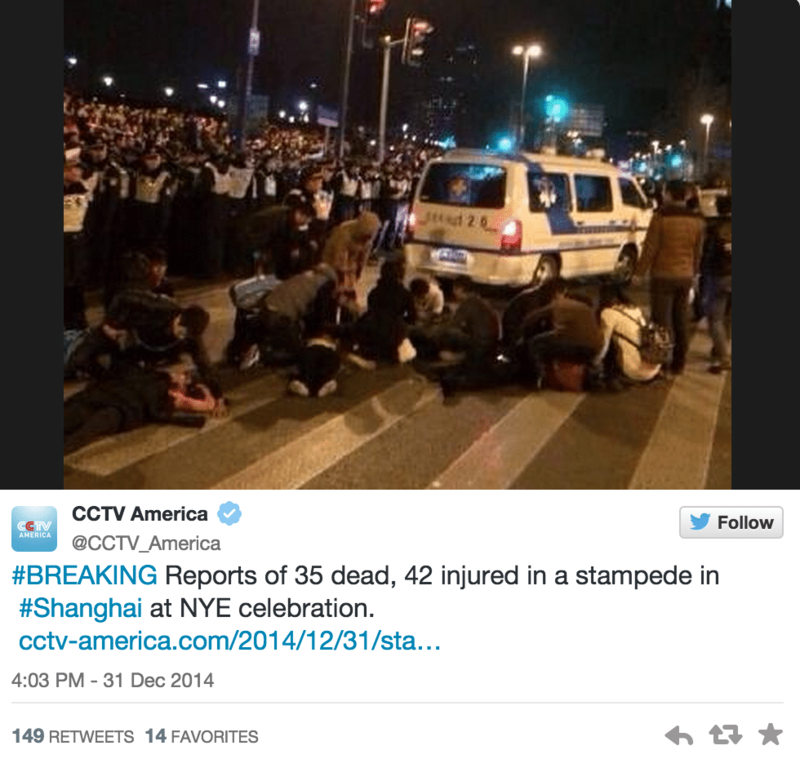 ‘This incident happened after the stampede,’ police said in a brief statement, without saying what the real cause was. Another witness, who gave his family name as Wei, said there had been a problem away from the area where the fake bills were thrown, with people trying to get on to a raised platform overlooking the river. The promenade in the area known as the Bund along the Huangpu River is a popular spot for New Year’s Eve festivities in Shanghai. That said even before last night’s tragedy, local officials had called off a popular New Year’s Eve light show there, citing police concerns over crowd control. Last year, the event drew nearly 300,000 people and ‘dispersing the crowd became a massive administrative headache,” reported the Shanghai Daily. Foreign media has been forbidden from attending a police press conference, underscoring government sensitivity about any critical coverage of disasters.